Steph Skipworth works at a 911 call center. 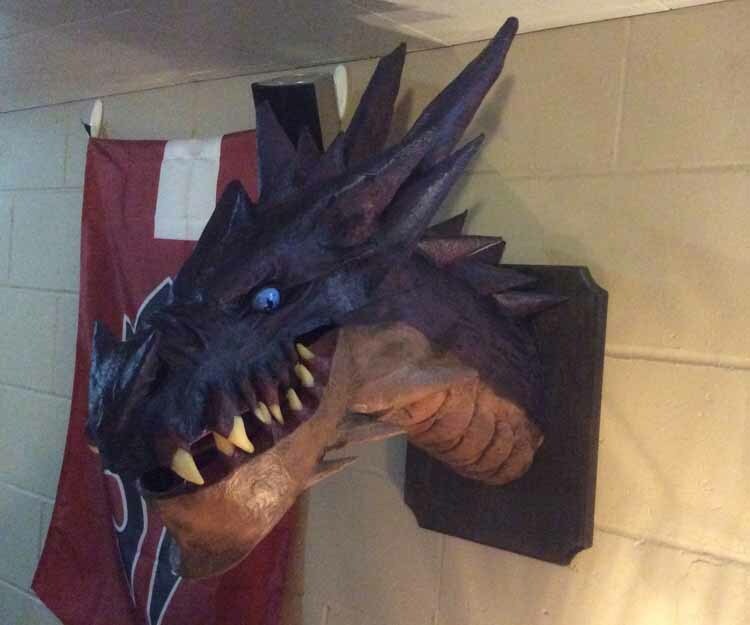 She made this dragon to hang on the job. What fun! 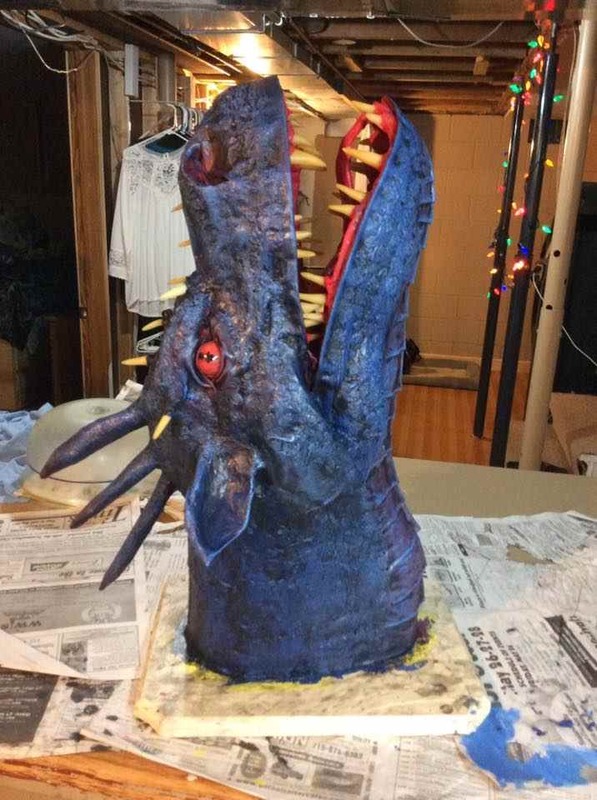 Here is Chris Fitzhugh’s first paper mache dragon! Fantastic job! Congratulations Chris! 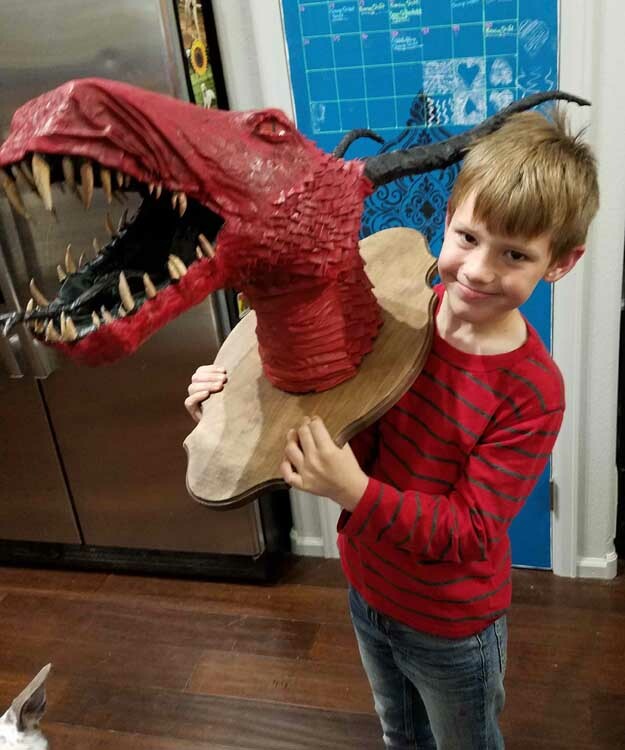 Chris just finished his first dragon trophy. Really great! 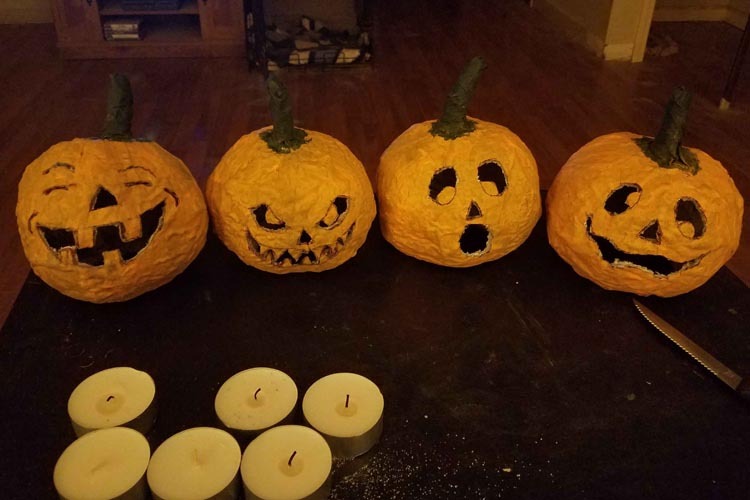 And Chris just finished these great pumpkins for Halloween this year! Excellent! 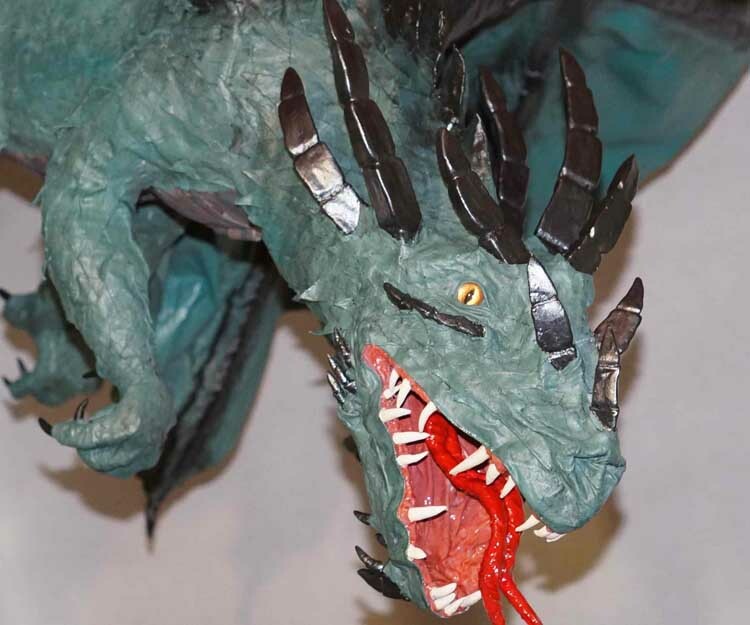 Below is Maddy JULIEN’s fantastic paper mache dragon. Incredible! And I love the backdrop! 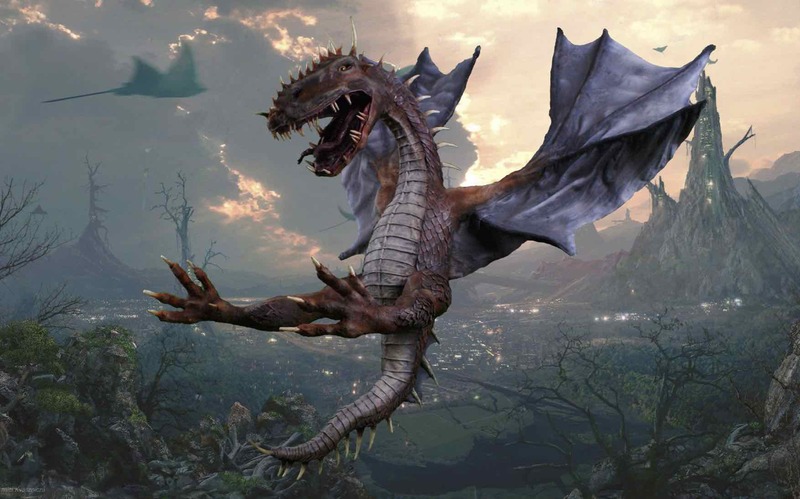 Check out this wonderful dragon made by Uwe Luckhardt! He shot the photo on green screen and put it on a great background. Fantastic! What fun to have an artistic grandpa like Richard! 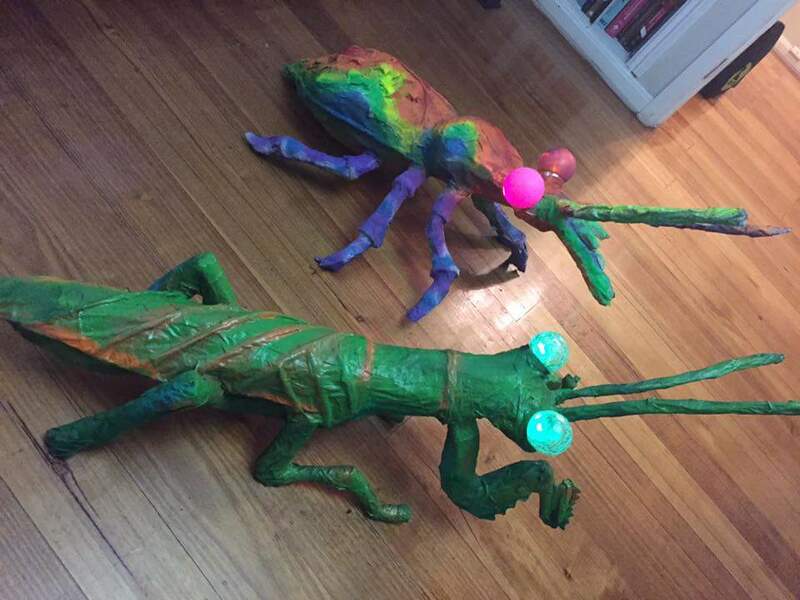 He worked with his grandkids to make these fantastic bugs! 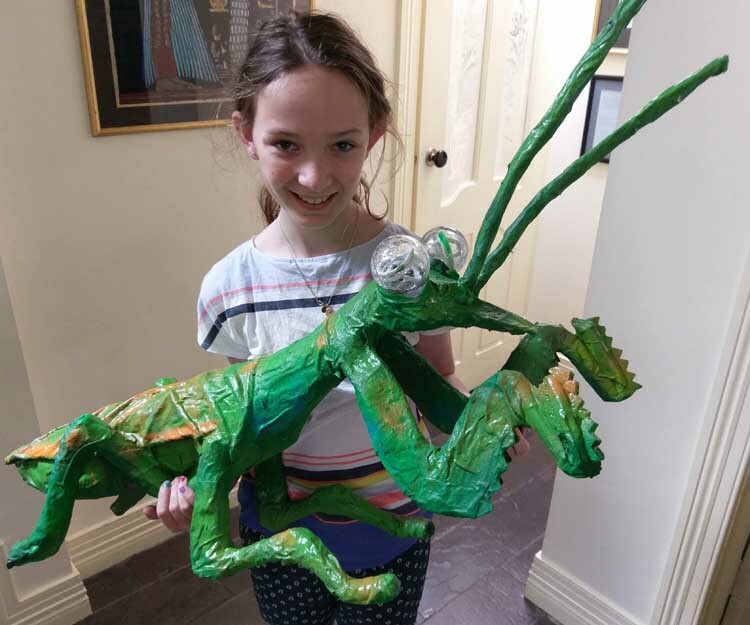 This is Isabel with her praying mantis. Excellent! 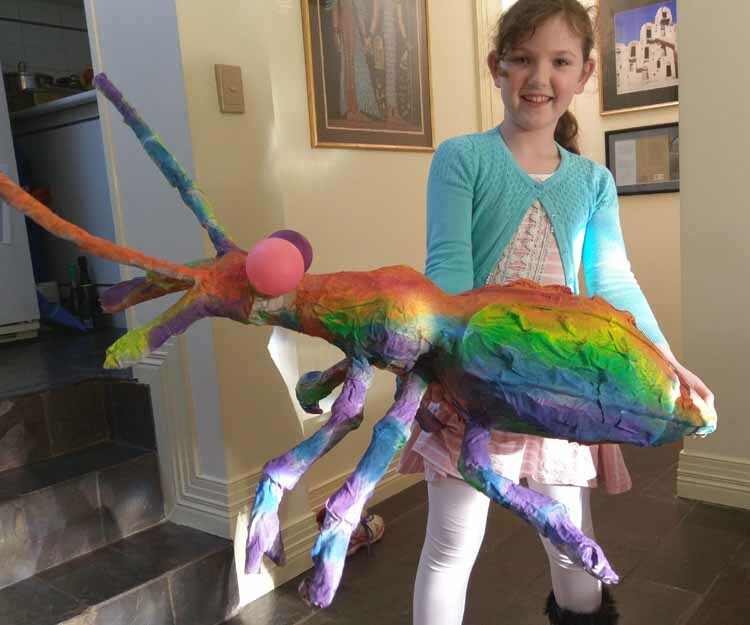 And here is Caitlin with her incredible bug! Love this! By the way…the bug’s eyes light up! Jeff Bullard works with a marching band (Mid-Carolina High School Marching Band, Prosperity, SC.) 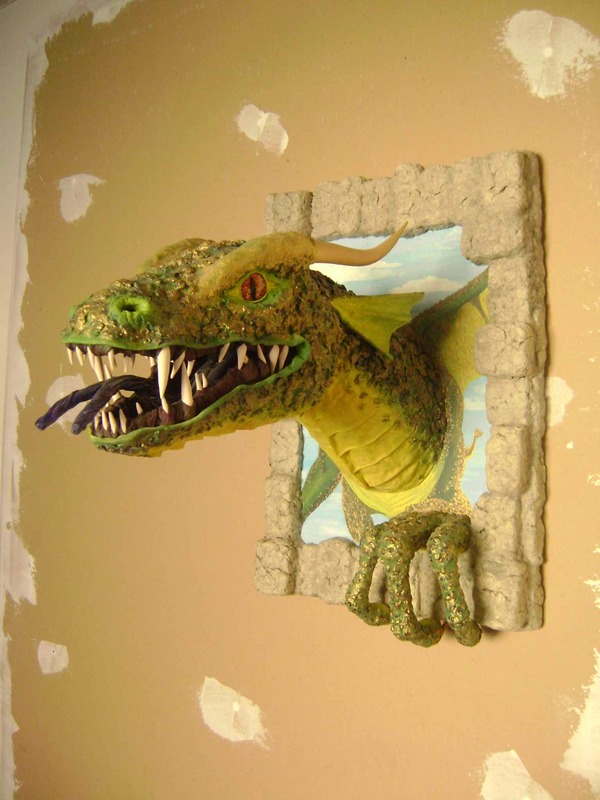 whose mascot is “Harvey” the dragon. They decided to build the mascot, complete with smoke coming out of the mouth! Very cool! 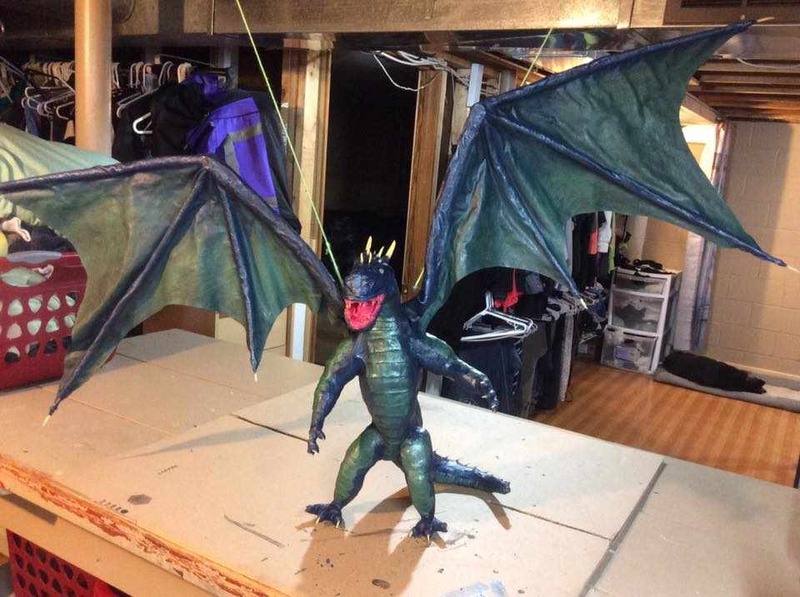 Arthur Wallis’ made this dragon for his father. It is called “The Red Terror,” understandably! Great job! 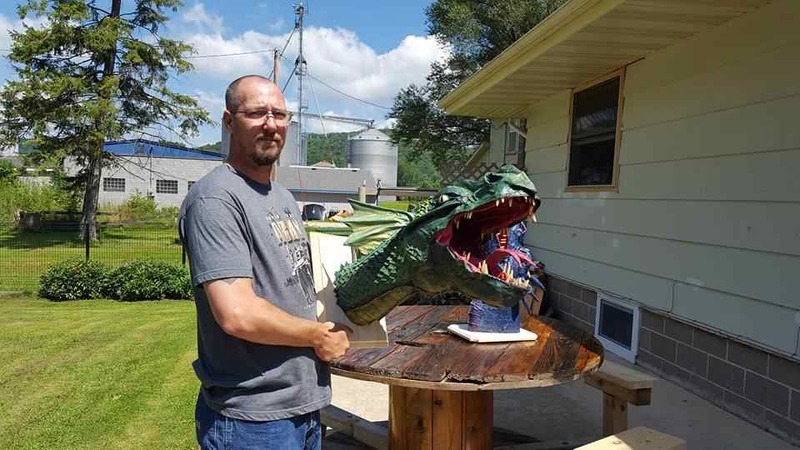 Honna O’Connell wanted to make something great for her son. And she did! Her is her son with “Knarly.” What a lucky kid! 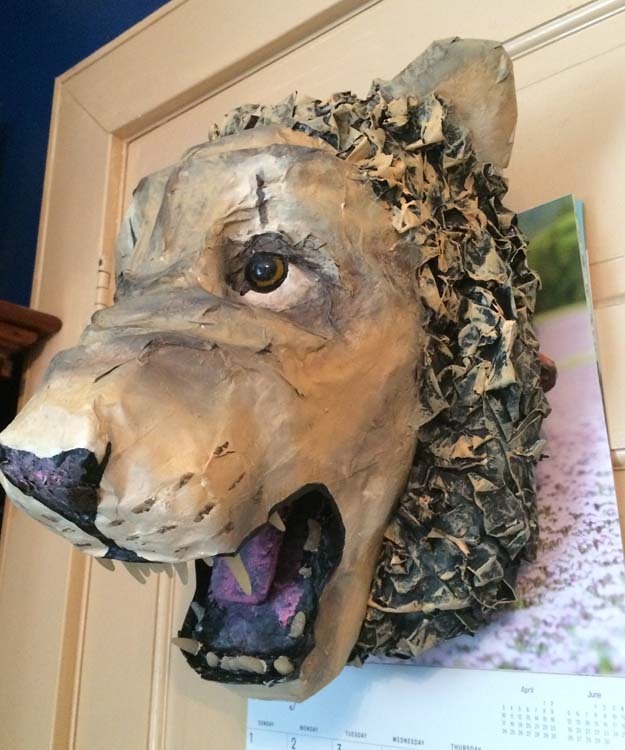 Markee has been doing art for many years but has only just begun using paper mache. And look what popped out! 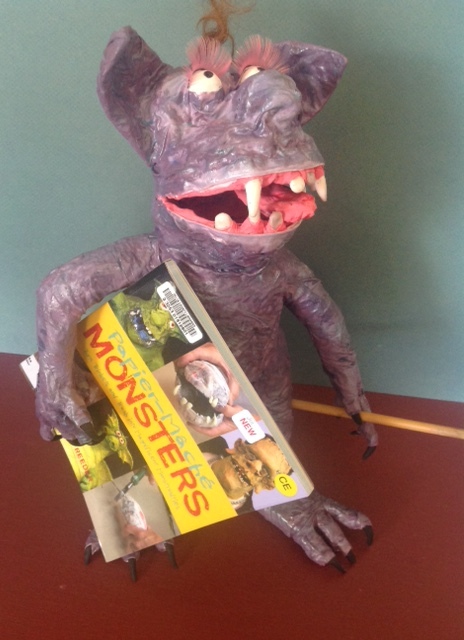 A very cute monster (with great taste in literature)! 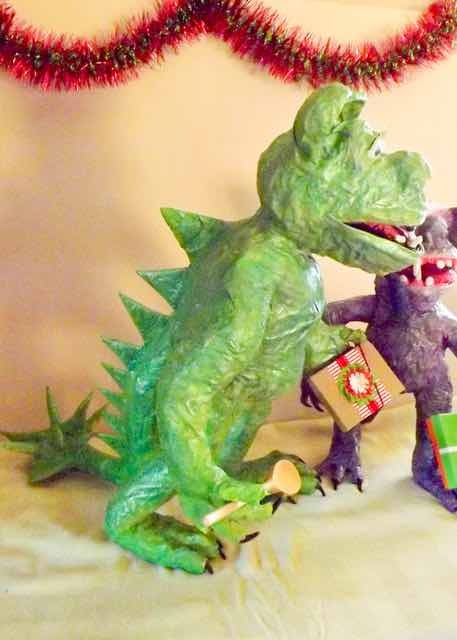 And here is Markee’s second little monster. 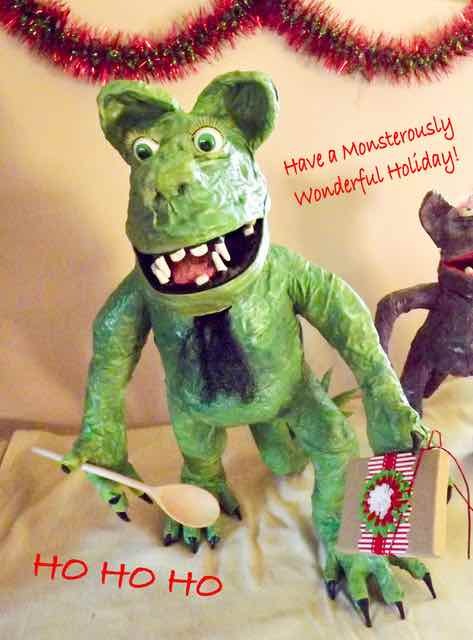 This one is titled, “Monster Holiday!” Wonderful! 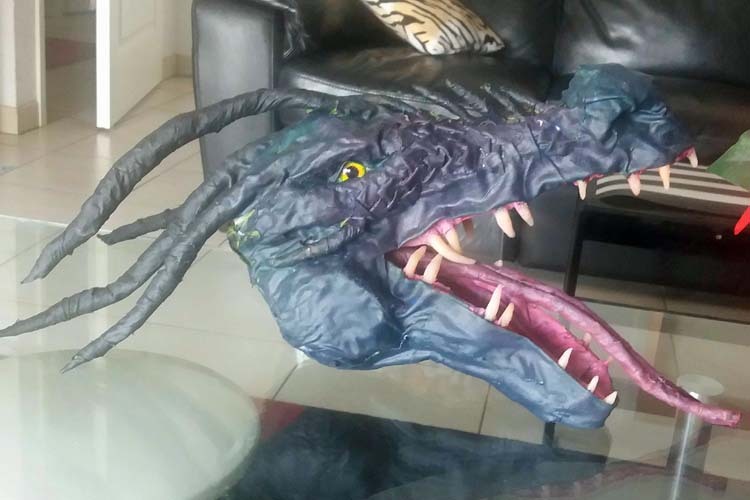 Speaking of great monsters… check out this fantastic beast made by Noninox Cenicerox! Fantastic! 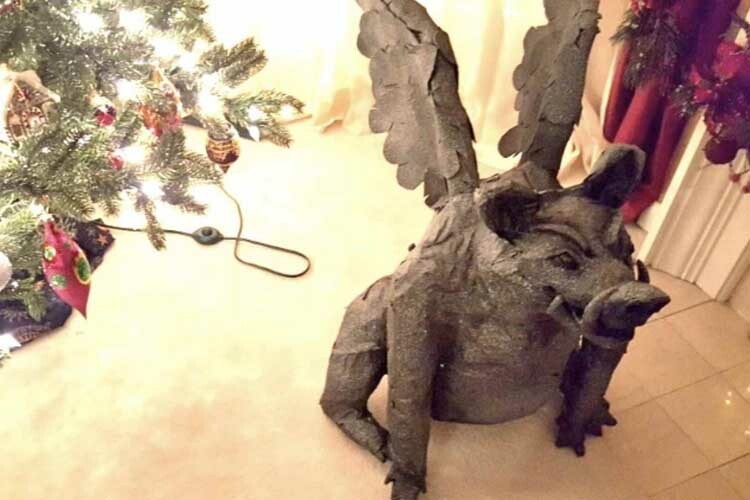 Peter (dad) and Kelsey (daughter) worked together to create a wonderful dragon. They named it “Irma” because they were finishing as the hurricane blew through! 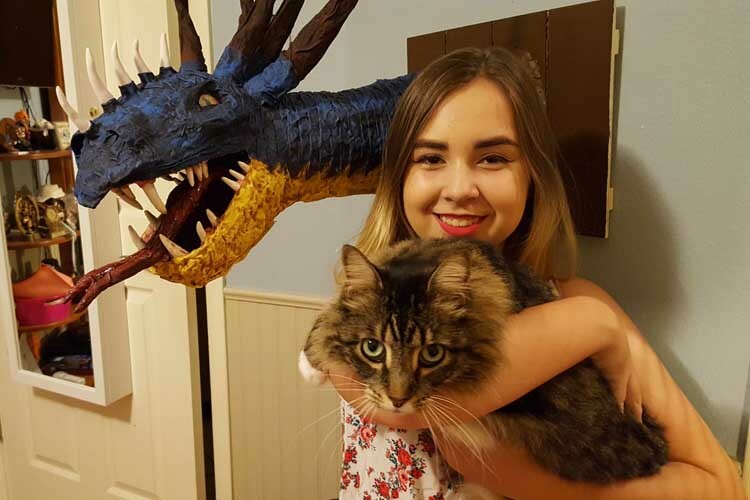 Below is Irma, Kelsey and their cat, Loverboy. All three…adorable! 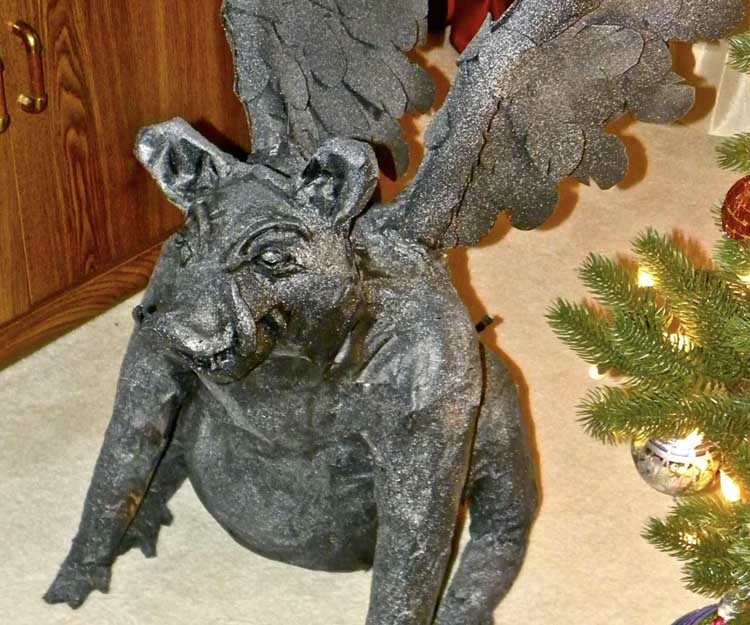 …and this is Ethyl. Such fun! 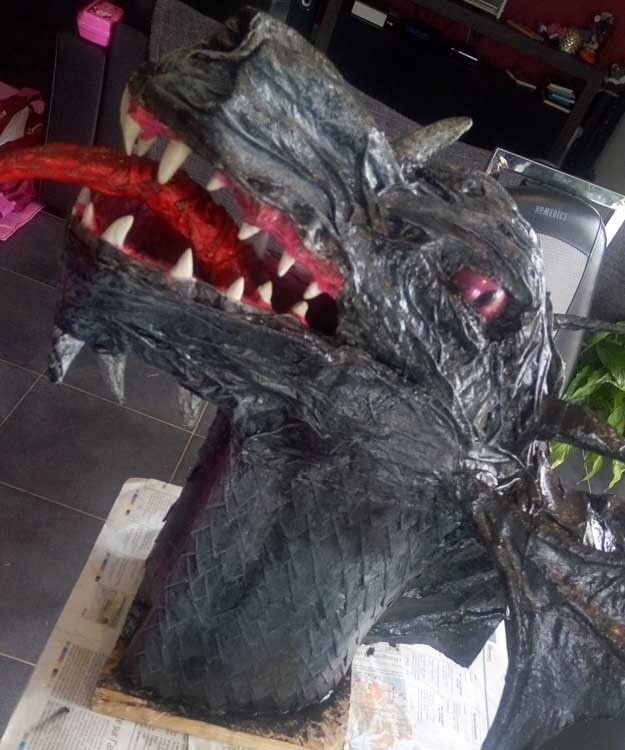 Below is a dragon trophy made by Olivier alias Elyrius Jablonski from France. Wonderful job! Kseniya lives in Yekaterinburg, Russia. 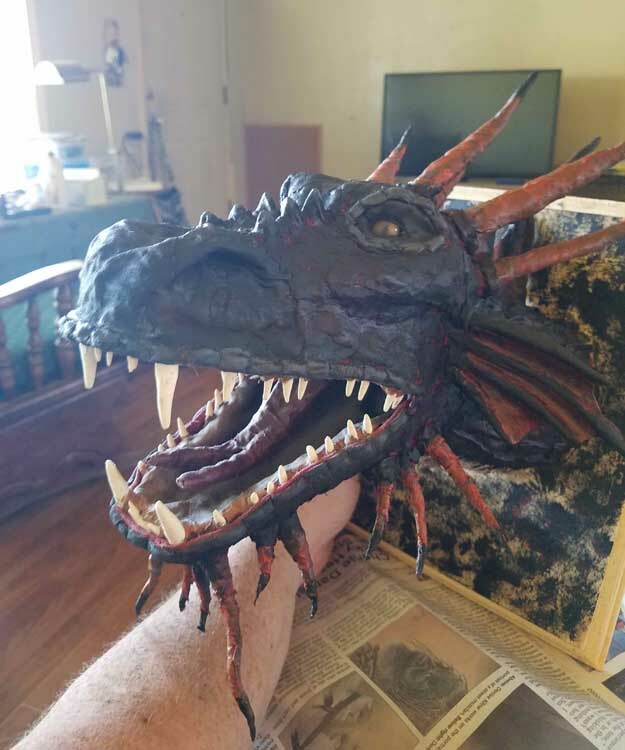 She has been making some great dragons! Here is a couple of them. 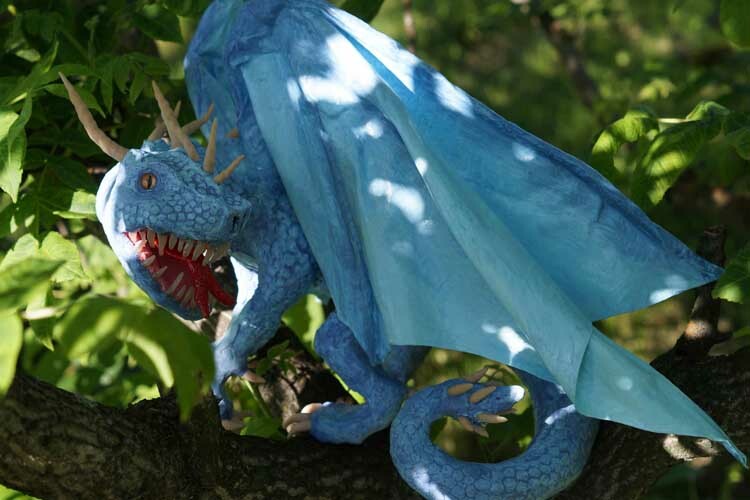 First the blue dragon. 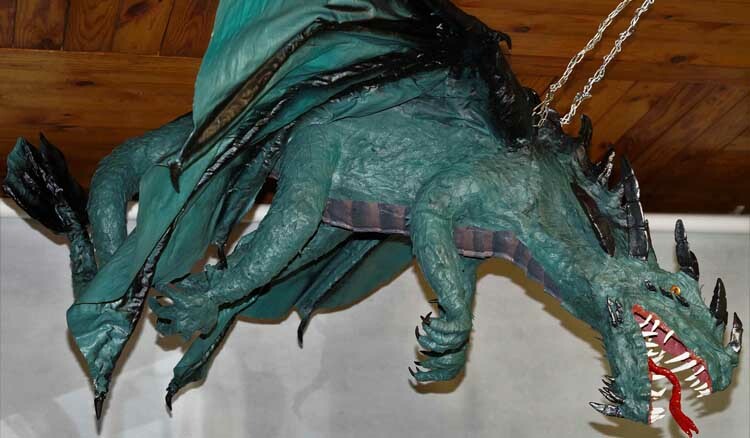 Then a green, hanging dragon (along with a close up). 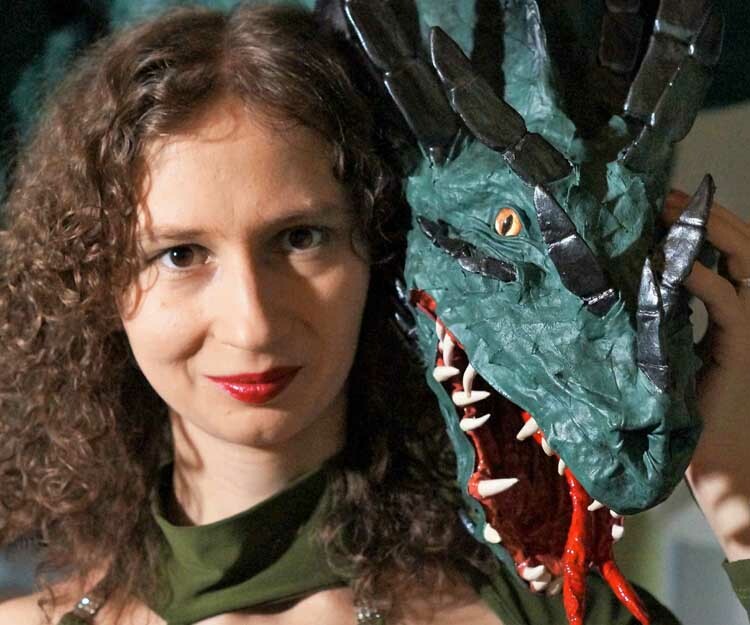 And finally a photo of Kseniya with her dragon. 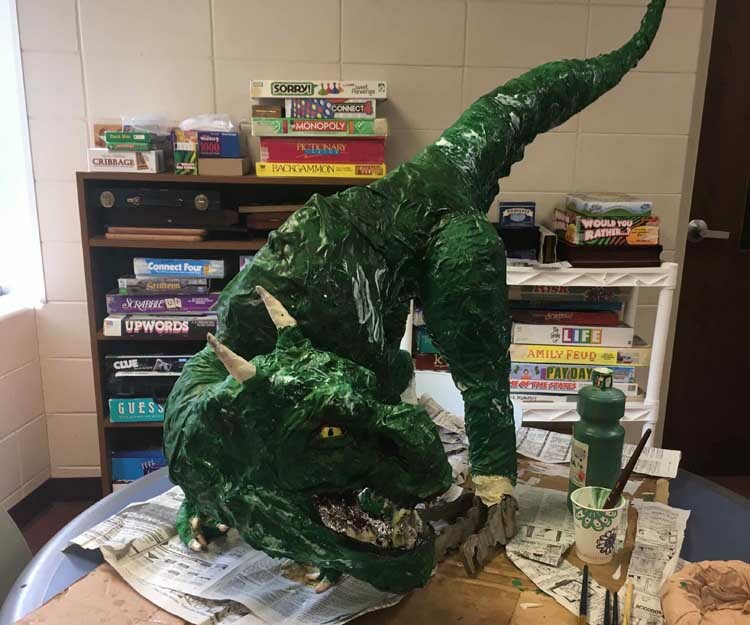 Christopher Solchen worked with kids from School District 197 in Minnesota this summer. 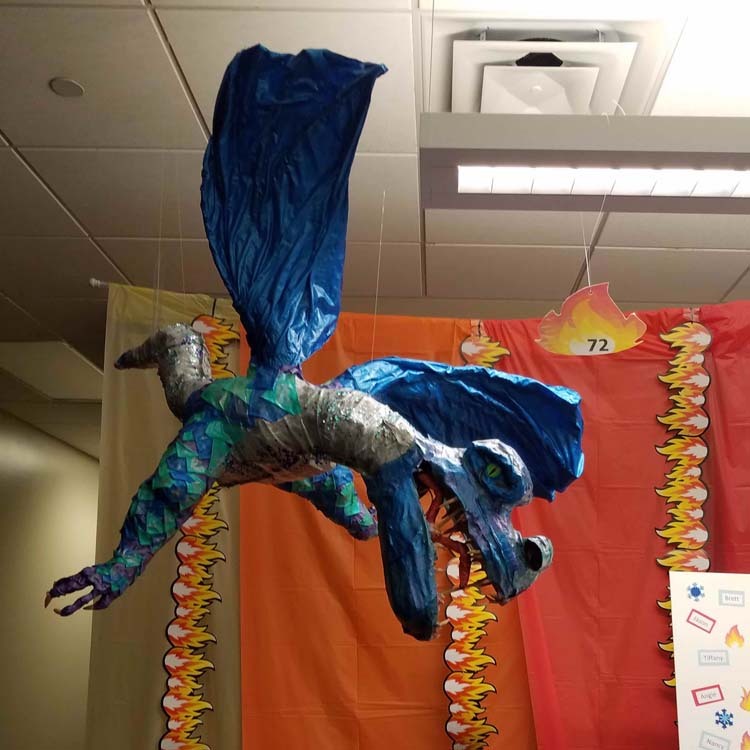 They made a dragon while in the day camp. This was the only photo he was able to capture before the camp ended. It is certainly a worthy project! 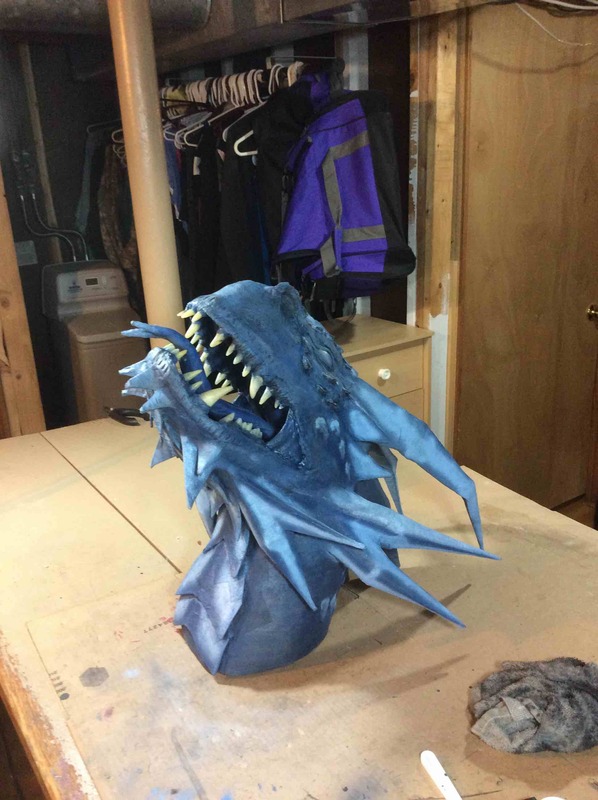 So here is “Storm the Dragon!” Congrats to Christopher and all the kids! 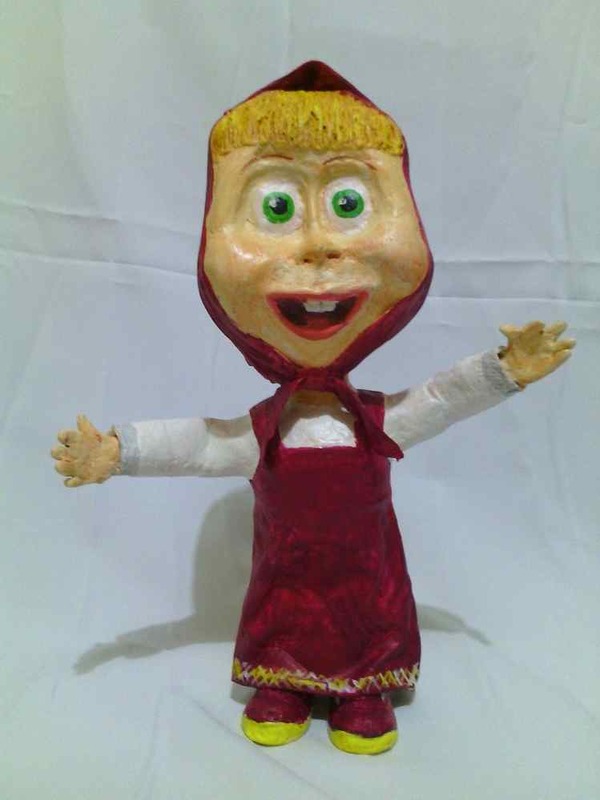 Look at “Masha” from “Masha and the Bear,” made by Dazz (D.A.). Wonderful likeness! 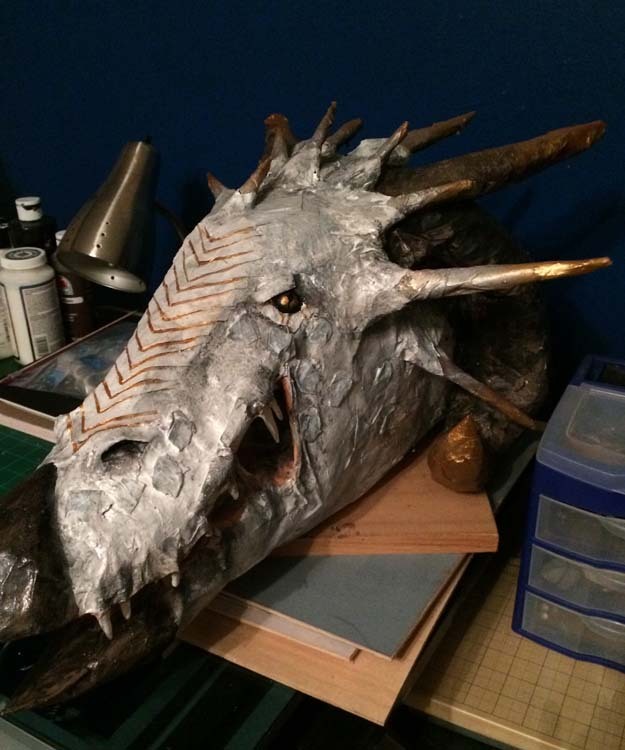 Jeremy Boelter made his first paper mache dragons recently. Very nicely done! You can see what Jeremy is up to on his Facebook page. 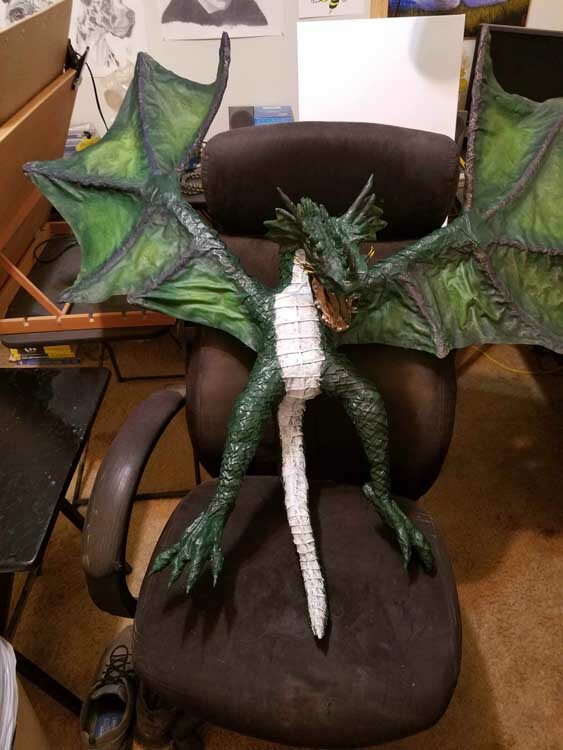 And this is Jeremy’s first full dragon. Very cool! And here is Jeremy’s third trophy. Excellent! And his latest, “Ice”. Great! 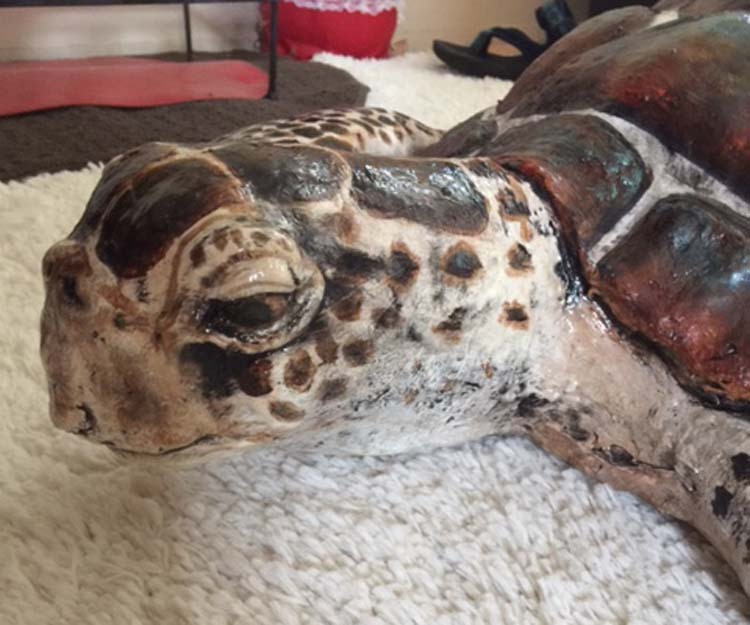 Below is Linda Bunnell’s turtle. Just an amazing job. 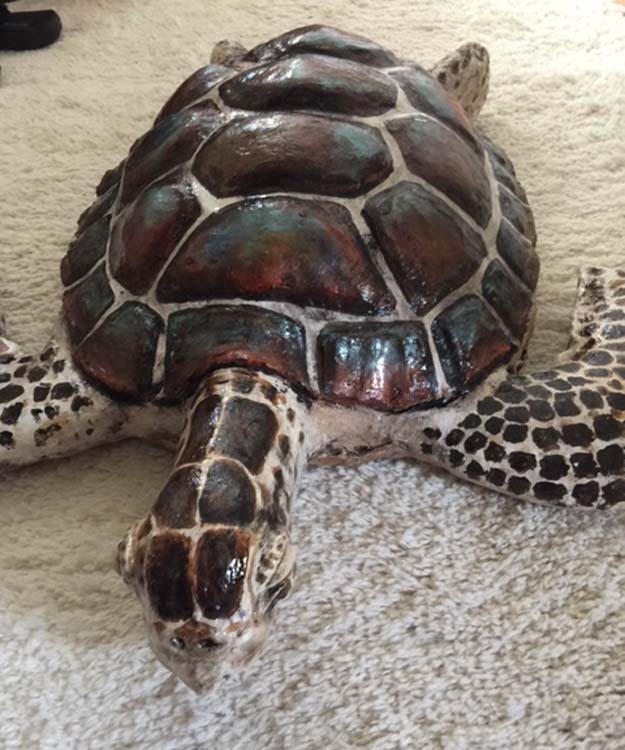 Love the shell! 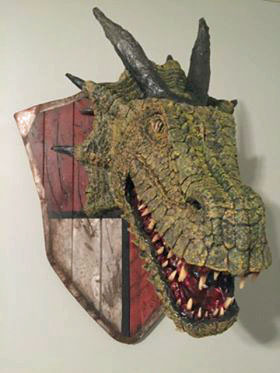 Look at Chad Dean’s great dragon trophy! He made the plaque as well. Sweet! 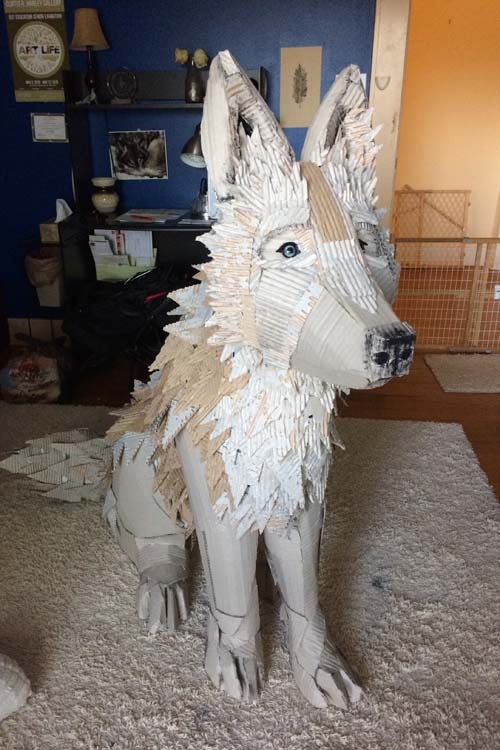 Grace Jerome has made some fantastic paper mache works! 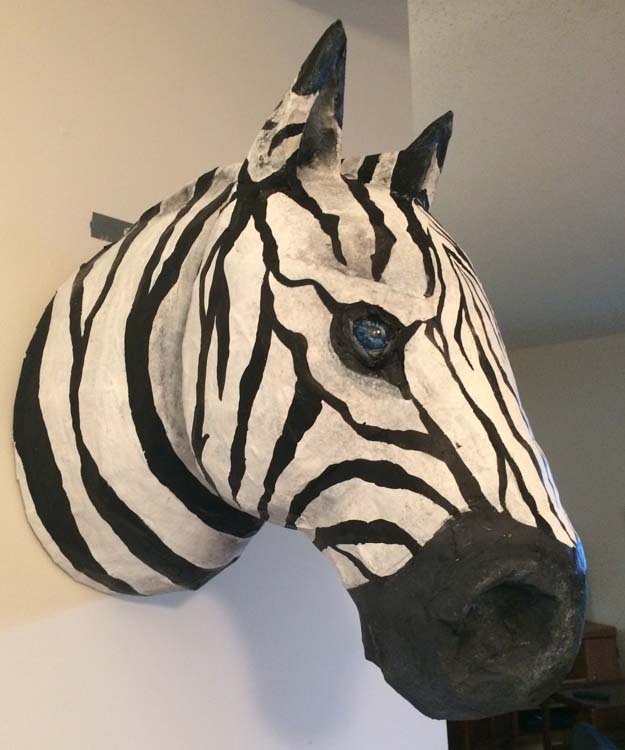 Here is her Zebra. 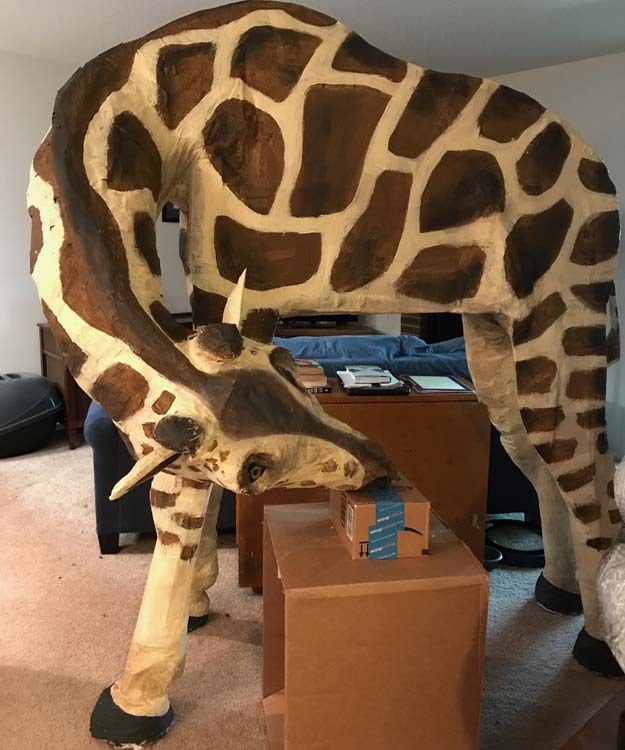 Finally, look at this incredible, full sized Giraffe! 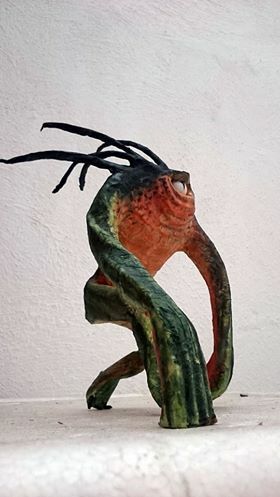 Check out her Facebook Page, https://www.facebook.com/gracejeromeart. 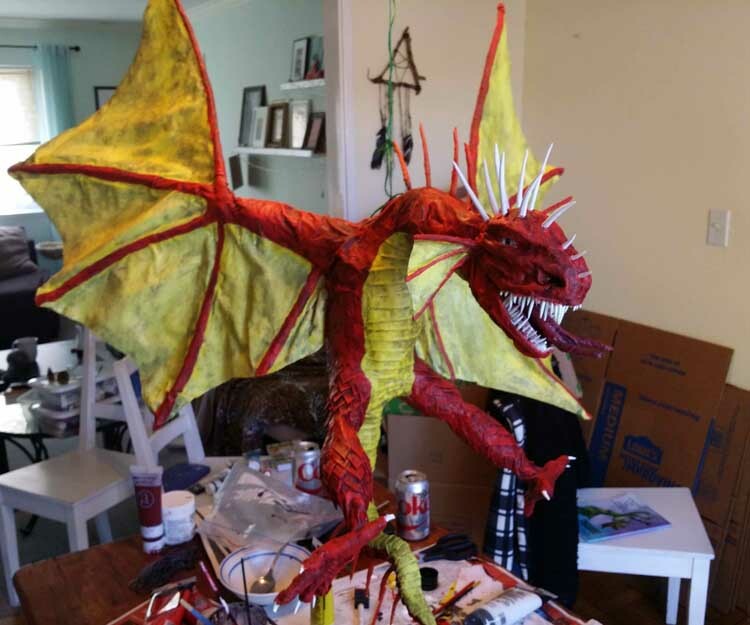 Trecy B just finished her first paper mache dragon. Wonderful!